Have you met the Yarn Bus? Our friends at Haus of Yarn have opened a mobile yarn store and while they normally cruise around Tennessee this weekend they are at Stitches Midewest in Shaumburg, IL. The Yarn Bus and everything is right on the show floor! Better yet they're featuring our Wooly Worsted yarn in some pretty awesome kits. 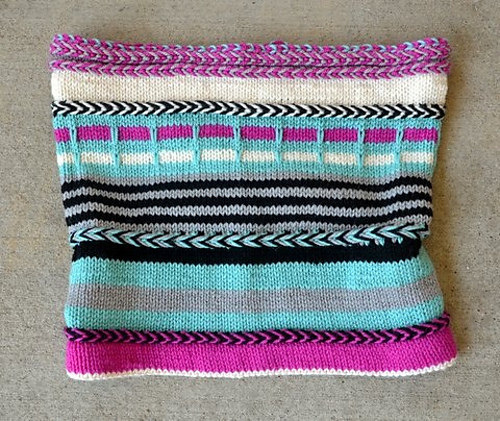 The Yipes Stripes Cowl knitting pattern and Wooly Worsted yarn were a match made in heaven! Marissa made hers in Vanilla, Berry, Black, Aquamarine and Brushed Silver yarn colors and I think it's totally awesome! Go say hi to Marissa and the gang from Haus of Yarn and their awesome Yarn Bus this weekend! Don't forget to grab your own Ewe Ewe Yipes Stripes Cowl kit!